Sandy Dunes condominium, beach resort home in North Myrtle Beach. Our condo 'The Turtles Nest' at Sandy Dunes is an intimate setting with only three levels overlooking the ocean. Unit #3 is on the second level. Our condo has 3 bedrooms and 2 baths. The condo sleeps up to 8 people (One King, One Queen, two singles and a queen sofa bed) Best view of ocean and beach you can get! Panoramic view of ocean and beach from living room, kitchen dining room and master bedroom is wonderful. Sandy Dunes Condo Rental in North Myrtle Beach SC.. Golf, beach activities, deep-sea fishing and more bring vacationers to North Myrtle Beach, located on the the South Carolina coast on the famous Grand Strand strip. In North Myrtle Beach, you can explore a nature-trail filled with migratory birds, get an adrenaline-fix at one of the local amusement parks or take in live-theater. The mild subtropical climate in North Myrtle Beach means that outdoor activities are available year-round. 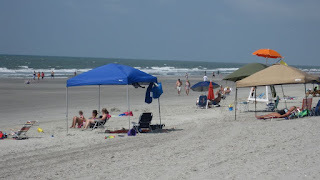 North Myrtle Beach, located in Horry County, serves as one of the primary tourist areas on the Grand Strand. The North Myrtle Beach population is 14k+, it's the vacation destination of choice for many beach goers.